While reading through a Fall Recipes magazine, I came across a recipe for a black bottom pumpkin pie. I tried out the recipe, but wasn’t all that impressed with how it turned out. The pumpkin layer was literally like pudding, and when I think of pie, I think of actually being able to cut a slice, rather than having to use a spoon to scoop it out due to the texture. Well, back to the drawing board. I decided to give it another shot, but change a lot of things around. This time, an Oreo crust was prepared, but in a two 12 cup muffin pans. 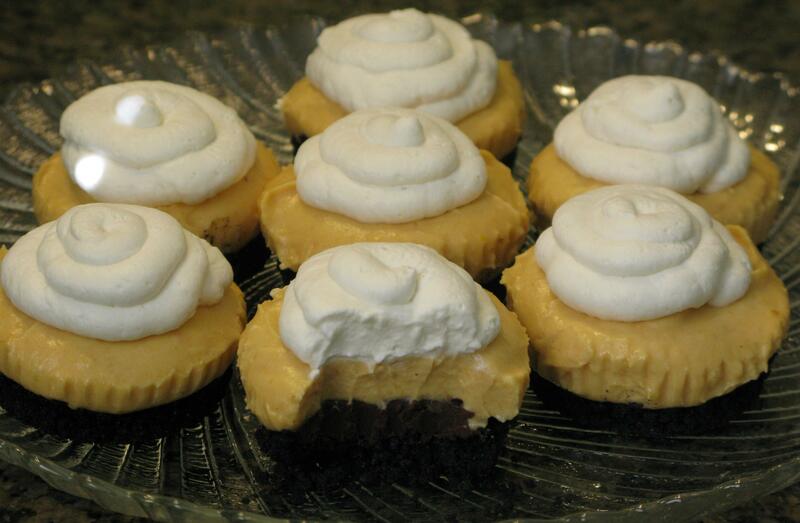 How about make these little guys individual portions instead of a whole pie? Sure! The waiting process of letting them set in the fridge seemed like it took forever, because I couldn’t wait to sink my teeth into them. Well worth the wait. Wow. Preheat oven to 350 degrees. Process cookies into crumbs using small food chopper or food processor. Mix together the melted butter with crumbs. Using a medium size cookie scoop, distribute evenly between 24 lined cups between two muffin pans. Bake for 5 minutes, cool completely on cooling racks. In 30 second intervals, melt chocolate chips in heavy cream in microwave. Stir until chocolate is completely melted and mixed with cream. Drop 1 teaspoon of chocolate on top of each Oreo crust in muffin pans. Put in refrigerator to set, about 15-20 minutes. Combine all ingredients in mixing bowl, and beat at medium speed with electric mixer until blended. Using a standard ice cream scoop, distribute evenly between all muffin cups on top of chocolate. Use a spoon to spread evenly. Set in refrigerator for a minimum of 4 hours. Top with Maple Whipped topping. Using electric mixer, beat at medium speed until mixture is thickened and forms soft peaks. Generously spoon or pipe on top of pies. Ooohh i wonder where i can buy tinned pumpkin in the UK? I’ll have to check it out. They look too good to not make!